three umbrellas: Hero Arts Handmade for Christmas Blog Hop! Hero Arts Handmade for Christmas Blog Hop! 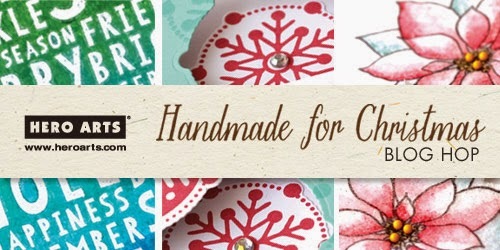 Welcome to the Hero Arts Handmade for Christmas Blog Hop! the higher your odds of winning! I knew that I wanted to watercolor them. and I chose a non holiday sentiment because of all the dazzle and bling! Your next stop on the hop is Tami, and I can't wait to see her fabulous project! of $75 in Hero Arts goodies, and two $10 gift cards for the Hero Arts online store! and the winners will be announced on October 3rd on the Hero Arts blog. Oh, I love your card! The new HA stamps are gorgeous and you made them even more splendid! Such a pretty card, Donna! Love your watercoloring, and the gold embossing! I love the way you colored the ornament. Your ornament is super! Love the stamp and colors! Beautiful card - I'm now inspired to get crankin' on my cards for this holiday season! I love the vibrancy of the watercolours against the gold embossing! wow! I never took a second look at those stained glass looking ornaments till now........fabulous card! As a formeer math teacher I love the ornament. Great job on the card! Like the gold embossing & dimension of the ornament card. Wow! What a great idea with toy! Your card is gorgeous! I'm so happy that you used the Christmas Crystal set. Thanks for the inspiration! The ball looks almost like staines glass; beautiful! The mosaic ornament is so pretty. Just beautiful. Wow - that's spectacular - love your colouring! Fabulous design, love your card!!! Absolutely gorgeous...love the coloring on the ornament. So very pretty! The combination of gold embossing and water coloring is beautiful. Love that ornament. Different take on Christmas but I like it. WOOOOOOOOOW! This is a DAZZLING card! WOW! WOWOWOWOWOW! LOVE your watercoloring and the gold embossing! BEAUTIFULLY done, Donna! So shimmering and beautiful! Looks like real glass! Wao! This Crystal ornament stamp set its beautiful! Love your coloring and the hanging branch its perfect! I think this stamp set its very versatile for other non christmas project! Thanks for sharing! I love the watercoloring with the gold embossing, very striking! Love the watercolor and the gold embossing. A lovely card, Donna! Wow! That ornament looks great! Lovely - the shine and the gold are awesome. What a beautiful card. How I so adore that bulb and the beautiful pine embossed in gold. What beautiful watercoloring. Wow!! Beautiful stamp set. These cards just keep getting better and better!! Hero Arts always delivers the most amazing products!! Wow, great blending in such a small area! Pretty card. Wow what a beautiful card. I love the gold! Using watercolor on the ornament is fantastic. Really gorgeous. Love that ornament stamp and the fab rainbow colours! Beautiful!! Just love the gold embossing…really just love it all!!!! The gold embossing and watercoloring make for a lovely and striking card!! Stunning card! The watercolors look beautiful with this stamp!!! What a beautiful card. Love the rainbow colors. Geomtery and rainbow clors applied in a fantastic way tocreate a joyful Holiday greeting! Donna, this is so creative and a great way to show these stamps in a holiday way! What a beautiful ornement ! Your card is gorgeous - and what beautiful colors you chose! I just bought those peerless watercolors ... this is fabulous, Donna!! More than fabulous!! Big hugs. Love this design - the watercolors are so soft and nice on this. beautiful watercoloring - so elegant! Wow! Your card is dazzling. thanks for sharing. Love it! Love the colours you chose for that ornament! This is such a different card with great colors. I absolutely love this! Cool modern twist on a classic design. Love it! Your coloring technique really made this card. Beautifully done! I love these stamps and they are perfect for coloring. I love the gold - amazing card! Oooo beautiful card! I just received this stamp set a couple weeks ago.. Thanks for inspiring me to use it today!! OMG girl your card is absolutely gorgeous OMG!!! You really did one spectacular creative job....I totally awe struck by what you did I read your recipe and just shook my head with what you used and your end result. You are most certainly one super talented gal who crafts with passion. WOW the lucky person who receives your card is in for one fabulous surprise and don't be surprised when you find out that your card is set out for years and years to come it is one amazing pieces of creative art to be cherished!! Love the water coloring on the ornament! What a beautiful card. The gold embossing adds so much to it. I also really love the non-traditional greeting, too! The gold pine branches has me inspired. Lots of great details -- love the gold embossing and how you hung it from the tree branch. I love you card. The choice of colors in the ornament is so great it really makes it look dimensional! I really like this card! Love how you used two different stamps and put them together! Love the watercolor too! Lovely card - that ornament really has lots of possibilities! Interesting use of non-traditional colors. Love it. I love your card , The embossing is just gorgeous and your water coloring is spot on beautiful !!!! The gold with those colors and stamps - outstanding!!! Stellar. It just caught my breathe. Beautiful and classy. Love this idea. Many thanks. 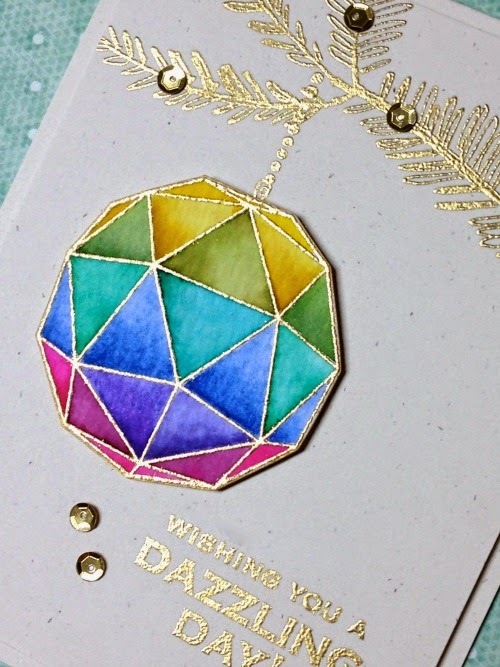 Really lovely coloring on your beautiful card--the sentiment is perfect with the ornament! Nothing makes me smile more than rainbow colors! I love the gold embossing. Love your ornament. It makes the cards. Beautiful card! The rainbow colors are wonderful. Non-traditional sentiment for a holiday card is a daring idea. I love the coloring on this card it is so pretty! Almost reflective. Very different and oh so pretty! Oooh! So pretty, Donna! Love this set! This card is dazzling! The colors are beautiful and i love the branch it hangs on. Just lovely. Love the watercolor and gold embossing. Omg! I love it! Great Job!! What an impact! Love the colors! Captivating! That ornament takes on a whole new look with your water coloring! It's beautiful! Love the gold embossing and the pop of color from the ornament!! Beautiful!! This is so beautiful embossed in gold and your ornament is colored to perfection! That stamp looks three dimensional, love it! In love with all that gold embossing and the coloring adds so much dimension! the watercolor ornament is so pretty. 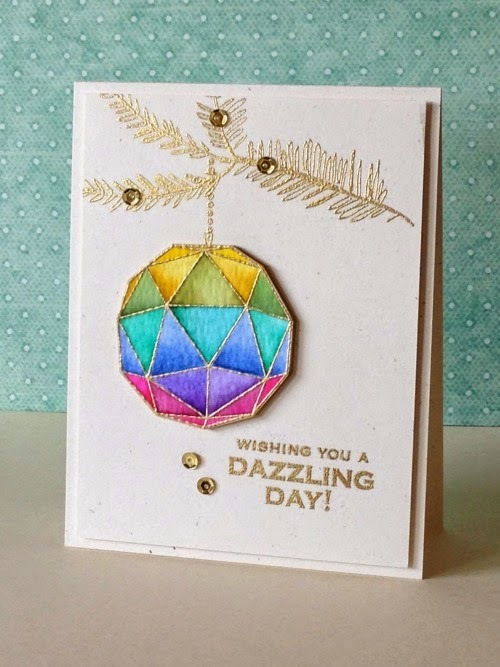 Love the embossing and the beautiful colors that you used for the ornament! LOVE your Midas touch, Donna! This card is so YOU, so amazing! Love Virginia's comment. I love the vibrancy of the Peerless. And it plays with your gold so well! Looks just like stained glass! What a great idea! I really like your choice of watercolors on this ornament. It is very pretty. Love your ornaments colors, cheerful and bright! Oh my...this x'mas crystal is so lovely with all that water colouring! what a brilliant card! ohh emm gee! This card is awesome! I love the idea of water coloring the ornament and making it look like it's hanging from a tree. GORGEOUS... I love it!!! very spectacular... Winner winner Chicken Dinner. Gorgeous color and sparkle!! Beautiful! WOOOOOOOOOOOOOW Pow!!!! AWEmazing Love this so much Donna!! You Rock!! wow, wow, wow, wow! You have made me want this stamp set very badly. Beautiful water-coloring. This card is stunning--takes my breath away! So gorgeous--thanks! That is DAZZLING! I want to make it. Gorgeous! Thank You. Soo pretty and the water color is a great idea. Thank you. These multifaceted images are very intriguing...beautiful. The gold is so pretty and enhances the colors of the ornament! So Pretty, love the gold. Beautiful detail Donna!! I love the watercoloring and the gold!!! Wow, Donna - love that gorgeous watercolored crystal!! Looks great on the gold fir too! Absolutely GORGEOUS card, Donna!!! Your gold embossing is perfect with your water coloring...so pretty! Colorful card. Thank you for a chance to win. Just dazzling! The Peerless watercolors are so vibrant. Your card is dazzling.....how I would love to receive such a beauty!!! This card is beautiful! I love the colors and the gold embossing! Fantastic card, Donna! Gold embossing is always so elegant, love it! Love this stamp; so versatile. Glad to see a non-holiday way to use it. The combination of embossing and water color looks just like stained glass. Great stamp set. That crystal ornament is modern translation of a very traditional part of Christmas. I love the colors you used to color it. Just beautiful. Love the gold and the jewel colors together! In love with this one. The watercolor, the design, the whole thing! I wasn't a big fan of that stamp set until I saw what you did with it. Fabulous. What a stunning card! Can't wait to try this. The watercolor facets look great! This is so gorgeous! Love the coloring and the gold edges and branch this way. So creative, sis! Love you use a Christmas stamp to make a non-Christmas card! I really like this non-traditional card ... the watercolors are perfect for this stamp! Thanks for sharing. I just love the stained glass effect and it seem so dimensional. It's perfect! I love this card. It's special because some of us don't actually celebrate Christmas, so you have given an option for all! Oh my goodness! Absolutely stunning!! Love the vibrant watercolor with the gold embossing! Absolutely gorgeous. I always enjoy your blog so much! I have wanted to try Peerless watercolors - you used them well on the ornament. Beautiful water color ornament. I also liked the embossed tree firs. It's amazing how dimensional this looks! Wow! Absolutely stunning design. I love your festive ornament! All the embossing really works it's magic too! So unusual...so modern. Love it! Unique. Beautiful, love the colors. Great glitz and bling. I want that stamp! Another beautiful use for my Peerless. Gorgeous card! Wonderful watercoloring, thanks for the inspiration! Love the christmas crystal stamps and love the use of watercolors on this card. I have been really enjoying every water colored card you have made lately. They are truly beautiful. I never use gold embossing, but seeing the pine done that way, I will definitely give it a go. Thanks for the inspiration (as always!). What a unique and modern ornament! Donna, your card is fabulous for Christmas too! Love the color on this ornament! nice card. I really like the "dazzling day" Want it.